Whether they follow science news closely or not, Americans take for granted that discoveries in the sciences are occurring constantly. Few, however, stop to consider how these advances—and the debates they sometimes lead to—contribute to the changing definition of the term “science” itself. Going beyond the issue-centered debates, Daniel Patrick Thurs examines what these controversies say about how we understand science now and in the future. 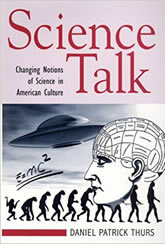 Drawing on his analysis of magazines, newspapers, journals and other forms of public discourse, Thurs describes how science—originally used as a synonym for general knowledge—became a term to distinguish particular subjects as elite forms of study accessible only to the highly educated.